The past 125 years have seen the Amsterdam - Churchill community grow into a tight-knit community, based on farming, which serves as a quiet reminder of rural Montana in an area seeing tremendous growth and change. The Settlement was formed in the latter part of the 19th century, as the newly-formed Manhattan Malting Company turned to Europe, and specifically the Netherlands, for farming families to supply the barley and operate the irrigation canals. As more Dutch families resettled to the community, the Dutch Reformed Church took on a central role in organizing community life that has continued to this day. Many of the same families who originally formed the settlements of Amsterdam and Churchill remain in the community today. As Bozeman and the Gallatin Valley continue their own transformation from agricultural valley to internationally - connected small city, Amsterdam/Churchill has begun to see an increase in growth as well. In order to address the impacts that inevitably accompany change, the Amsterdam - Churchill community has chosen to come together to draft the following community plan. What makes Amsterdam - Churchill a great place to live? What should change in the future in this community? From Dialogue to Action, January 22, 2008. Over 80 participants attended the second community planning event, called “From Dialogue to Action”, on January 22nd. Participants were asked to evaluate the guiding principles developed at the kickoff and list what actions and tools should be taken and used to implement those principles. Initial Recommendations, March 22nd, 2008. The third community event was a presentation and discussion of the initial recommendations from the steering committee. Those initial recommendations have been included throughout the plan. Steering Committee Meetings. A steering committee of approximately 12 community members was formed after the Kickoff Event to guide the planning process. The steering committee has met twice a month with staff from the Gallatin County Planning Department for the duration of the process; their work, combined with the community events described below, has resulted in the goals and policies presented throughout the plan. Large Landowner Meetings. Two meetings were held in Spring 2008 to directly address concerns for large landowners. Those meetings helped shape the goals and policies of Chapter 4, Rural Amsterdam - Churchill. Policies, which are specific action statements about how the community will achieve each goal. Partnerships. Partnerships, or agreements, between two agencies are a primary strategy communities can use to implement their planning policies. A primary strategy to implement plan policies in the Amsterdam - Churchill area is a partnership between Gallatin County and the Montana Department of Transportation. Investments. A second strategy to implement the Amsterdam - Churchill Community Plan policies involve investments or commitments. Investments require the residents Amsterdam/Churchill, the County, or perhaps outside agencies (such as MDT or federal grant programs) to invest time, energy, money, or a combination thereof. Requirements. Requirements can take several different forms. The most common type of requirement is a set of development standards which new development or changes in land use would have to meet (also known as zoning). These standards could include setbacks from canals or ditches, landscape buffers between commercial and residential uses to help compatibility, lighting standards for new commercial buildings, density requirements for new subdivisions, requirements for central sewer/water, etc. Other types of requirements could take the form of plan policy. Examples include planned road connections, trail connections, or sidewalk connections which new development would have to build as a condition of their approval. The plan is broken into two geographic areas: the Amsterdam - Churchill core, and Rural Amsterdam - Churchill. Partnerships, investments, and strategies are all discussed as implementation strategies for achieving the goals and policies of each geographic area. This plan will be adopted as the Amsterdam - Churchill Community Plan Chapter of the Gallatin County Growth Policy. Authority of this community plan is authorized by Montana State Statute and the Gallatin County Growth Policy. Section 76-1-106 of the Montana Code Annotated (MCA) requires local planning boards to prepare growth policies, and Section 76-1-601 offers general guidance for the contents of a growth policy and/or neighborhood plan. Sections 76-1-602 through 76-1-604 give the procedure for adoption of growth policy or growth policy amendment. Additionally, Chapter 4.3 of the Gallatin County Growth Policy authorizes the development of Neighborhood, or Community, Plans throughout Gallatin County. Those community plans must be drafted in compliance with the County Growth Policy, and are designed to give greater specificity within a certain defined area. How do we grow our core in a way that keeps the small town and rural nature of the area? What must be done to ensure that future development fits within the capacity of local public facilities and services? What must be done to sustain the agricultural landscapes and lifestyles on which the character of our area depends? What must be done to ensure that future rural residential development is compatible with the resources and lifestyle that attract people to live in our area? How can we continue to involve the community in the ongoing questions of growth and change? The answers to these questions begin with the Guiding Principles presented below. These statements provide the foundation for all policies which follow, and any decisions made to amend or update this plan should be based on this foundation. The following Guiding Principles have been used to guide specific policy direction in each of the geographic areas of the planning jurisdiction. Small Town Values, Rural Character, and Quality of Life. Many residents referred to small town and church-oriented values. Many people have stated that the community is a great place to raise a family, and the strong presence of the church and quality schools added to the overall sense of good values. Quality people and their neighborliness, care and respect for others, low crime, and the quiet, calm way of life have all been discussed as important values for the area which contribute to making Amsterdam - Churchill a great place to live. Agriculture Heritage and Wide - Open Views. Many community residents state the agricultural nature of the area adds significantly to the quality of life of the area. In addition to lending a strong sense of history to the area (note the reference to the founding of several family farms in the timeline), many residents appreciate the open spaces and views that active farms provide. Infrastructure. Numerous residents cite a need to address several infrastructure needs: an improved road system and road safety; a way to address pedestrian and bicycle needs, including sidewalks, throughout the community; and public - community water systems. Increased Local Control. Many residents expressed strong support for the promise of community involvement and grassroots democracy, and one of the top priorities discussed by participants was an interest in increasing local control through better planning. Additionally, tools such as zoning and incorporation were also brought up regularly, with many participants expressing a willingness and desire to explore options necessary to ensure that development occurred with the community’s values in mind. Agriculture and Rural Lifestyle. Numerous residents expressed a strong desire to keep family farms in business and preserve the agricultural land, lifestyle, and heritage that helps define the Amsterdam - Churchill area. Community Values. Community values rose to the surface as a top priority for almost everyone. The church, the schools, the family-oriented atmosphere, and the community pride shown by residents were all discussed as something the Amsterdam - Churchill community needs to consciously nurture as the area grows and changes. Adopt a land use map designating a core growth area around the communities of Amsterdam and Churchill. Generally, the boundaries of this area are shown on the Town Core map attached to this plan. New development in the Amsterdam - Churchill area will be focused within this core to allow for natural extension of the existing town-site. To preserve the rural character, the agricultural resources, and small town nature of the area, and to reduce conflict between new residential development and existing agricultural operations in the area, the majority of new growth will be focused into the Town Core where existing growth is already located rather than throughout rural Amsterdam - Churchill. As the core develops over time, a phased growth process, as depicted on the attached map, will allow for annexations into the core. Policy 3.2 details criteria for allowing development of Phase II parcels. Map 3.1 shows the potential growth areas within Phase I of the Town Core; following are descriptions of each of those areas. Category A: Existing subdivision and COS development. Much of the Town Core has already been developed in subdivisions over the past 40 years. Most of these subdivisions are residential in nature and have their own covenants. The majority of existing development consists of single-family homes, with a small number of multi-family dwellings existing throughout the Town Core. Additionally, the retirement home, related housing units, three churches, Manhattan Christian School, and Amsterdam School are located in the heart of town. There are places within these areas of existing development that could allow future redevelopment. Development standards written for this area will reflect the generally single-family nature of the existing developed area, with options available for some multi-family units, such as mother-in-law apartments and housing around the retirement home. Development standards written for this area will also clearly allow individuals to work from home, as long as those home occupations do not change the character of existing neighborhoods by introducing greater traffic or noise than is customary. Category B: Mixed Use and Commercial Development. There are a small number of commercial operations in existence in the Town Core, generally clustered around major intersections. These include the Churchill Branch of the Manhattan Bank, Churchill Equipment, Danhof Chevrolet, the Amsterdam Store, and other small commercial operations. Areas of future commercial will be designated along the north side of Amsterdam Road between Camp Creek and Churchill Road. Additional areas of potential future mixed use and commercial development will be designated west of the Amsterdam Road - Camp Creek Road intersection. Design standards will be adopted requiring parking lots and access roads to be located along the rear of any new development in this section to prevent strip commercial. Additionally, a canal runs through this property, and any development shall work with the canal company to mitigate any adverse impacts. Road connections should be designed to connect with Phase II property immediately north of this Category. The S ½ of the S ½ of the SE ¼ of Section 11. Category C: Ecton Ranch. The Ecton Ranch is a 348-acre property between Amsterdam and Churchill. The property currently has an approved preliminary plat for the Amsterdam Village project, a large mixed-use project designed to provide commercial development in the northeastern corner of the property south and west of the Churchill Bank, grading to residential development with substantial open space (approximately 50% of the development) on the remainder of the property. Steep slopes leading down to Camp Creek form the western edge of the property. While this property does have an approved preliminary plat, the planning process has identified several transportation connections (detailed in Policy 3.5) that should be made on this property if development plans change in the future. Additionally, the future land use map designates this property as “planned unit development”, to reflect both the existing approval and the community's desire for a development providing creative, mixed-use development near the Churchill Bank and the intersection of Amsterdam Road and Churchill Road as well as west of Bethel Church, and substantial open space and park space with residential development on the remainder of the property. Should the currently-approved development plans change, the development standards and this plan will encourage a similar style of development as currently approved for the Amsterdam Village project. Category D. This property is located east of the Churchill North subdivision and north of the Manhattan Christian School. This parcel is suitable for a large-lot development pattern (1/2-acre parcels) similar to Churchill North, with options for limited multi-family. The grid network of the Churchill North development to the east should be extended into this property. Development standards written for this category will be similar to those in Category A. The Valley Ditch is located in the northwest portion of the property and new development shall mitigate any impacts on the ditch. As described in Policy 3.5.5, a collector road should be extended east from Kunje Road south to Flying Eagle Way to provide a route around the outside of the Town Core for both emergency service vehicles and general traffic. This road extension will take pressure off interior subdivision roads of Churchill North and this parcel, as well as provide access to Phase 2 properties. Additionally, as described in Policy 3.2.3, this property should provide multiple points of access, using collector road standards, to the Phase II properties north and east. Category E. This area is located west of the Amsterdam Road - Camp Creek Road intersection. A development pattern similar to that of Category C (the Ecton Ranch) is considered appropriate, and any future zoning will reflect this pattern. Specifically, commercial and mixed-use development is appropriate for the area immediately contiguous to the intersection. Development standards similar to those described in Category B will be written to encourage a pattern of commercial development that adds to the small-town feel of the area and provides for safe and efficient access to Amsterdam Road. Future residential development, interspersed with abundant open space, is appropriate farther away from this intersection. Care will need to be taken to avoid any potential flood plain issues with Camp Creek. Additionally, road connections, built to collector road standards, need to be made to the Phase II property immediately south and west of this property. W ¼ of the W ½ of the SW ¼ of the SE ¼ of the NE ¼ of the NW ¼. Those parcels in the NE ¼ of the NW ¼ clearly defined as having separate parcel boundaries in Sub-Category B on the adopted Future Land Use Map. Category F. This area lies adjacent to Camp Creek behind the existing HR Vandykens subdivision #2 and below the bluffs bordering the Ecton Ranch property. There is limited access to Camp Creek Road and much of the property is comprised of slopes too steep for development. This property is appropriate for low-density development (approximately 5 -6 homes located throughout the property) providing a buffer to Camp Creek. If lots are large acreage, individual well and septic may be used. If lots are clustered, it may be appropriate for the lots to hook into the Churchill Sewer District. As with property described in Category E, care will need to be taken to avoid the flood plain of Camp Creek. Category G. This area lies between Godfrey Canyon Estates and developed Churchill to the north and provides an important opportunity to connect these two areas. A draw lies between the two properties in this area, and any road connections will need to be designed to provide safe access across. Policy 3.5.3 provides more detail on any connections provided by development in this area. Currently, there is an existing business on this property; development standards written for this area will grandfather this business, as well as provide opportunities for expansion that is compatible with the existing residential areas around it. New residential development shall be compatible with the Godfrey Canyon Estates development immediately to the south, with 8,000-10,000 square-foot lots considered appropriate. As the area designated as the Town Core builds out over time, other immediately adjacent parcels, identified on the Future Land Use Map as "Phase II", have been designated for potential Town Core development. Before these parcels become annexed, the following criteria shall be met. West of the centerline of the Valley Ditch in Section 13. 3.2.2 Contiguous to existing development. Phase II property may be annexed into the Town Core if it is contiguous to existing, platted development. 3.2.3 Capacity of community services. Capacity of the Churchill Sewer District to annex new property. The District's system will be considered adequate to service the annexed property if there is verified sufficient capacity to accommodate expected and ultimate peak flows from the proposed development, or if the capacity is expected to be provided within a designated time-frame to service the proposed development. This information shall be demonstrated prior to annexation of any Phase II property into the Town Core. Capacity of the Amsterdam School to serve the expected increase in students caused by an annexation. The number of anticipated students shall be calculated using the most recent statistics for Gallatin County used by either the Amsterdam School, the School Superintendent's office, or the most recent data provided by the US Census Bureau. Availability of water. It is the policy of this community plan to require major subdivisions within the Town Core to provide a community water system, rather than individual wells. Connection to a road network with the capacity, or designed to have the capacity, to handle the proposed increase in traffic. Interior subdivision roads alone shall not be considered adequate road connections for Phase II property; any annexations shall be required to connect to collector roads with adequate right-of-way and capacity to carry the increased traffic. Fire and emergency service capacity. See Policy __ for a description of policies applicable to adequate fire and emergency service capacity. If there are not adequate public facilities to service the new development allowed by the annexation, the annexation (and subsequent amendment to zoning) shall not be allowed until those deficiencies are addressed. 3.2.4 Access to a collector road. Phase II property may be annexed if it is served by a collector road. Property only served by an interior subdivision road must obtain access by a road meeting collector standards prior to any annexation. The Amsterdam - Churchill community and Gallatin County will use development standards to protect the character of its existing residential neighborhoods. Additionally, Amsterdam - Churchill and Gallatin County will promote safe, walkable neighborhoods by requiring sidewalks, curb and gutter, and street lighting in new residential developments. Many of the existing neighborhoods in the Amsterdam - Churchill core have existing covenants. Development standards will be adopted reflecting the protections of those existing covenants. Additionally, those development standards will protect community values by prohibiting bars, strip clubs, and casinos. 3.3.1 Adopt development standards identifying residential areas within the Town Core. The development standards designed to implement the Community Plan will designate land use categories that separate commercial areas of higher intensity from existing and future residential areas in order to mitigate potential land use conflicts caused by potentially incompatible uses. 3.3.2 Allow residential uses and limited live - work uses, such as home occupations and home - based businesses, within delineated residential area. Within those areas designated as residential, commercial uses will be confined to low-impact live - work units such and home occupations and home-based businesses. Generally, those uses will be defined as uses whose primary use is residential in nature, with business uses being conducted by the resident and a small number of employees on site. 3.3.3 Encourage safe, walkable neighborhoods and improve neighborhood functionality and design by requiring sidewalks, curb and gutter, and street lighting (or the "green" equivalent) in certain new residential developments. In order to improve the pedestrian experience and improve neighborhood design in the residential neighborhoods of Amsterdam - Churchill, major subdivisions within the core shall be required to provide sidewalks. Interior subdivision roads shall provide a sidewalk on at least one side of the road; arterial and connector streets shall provide sidewalks on both sides of the road. Additionally, curb and gutter, shall also be required in all development where the average lot size is smaller than one acre. Developments may also choose to provide a "greener" equivalent to this requirement, provided the performance of the infrastructure is of the same quality as standard curb and gutter. New residential development may be required to join the existing lighting district currently in existence. All lighting should meet the same lighting standards described in Policy 3.4.2. 3.3.4 Establish basic design standards for new buildings within the Town Core. In order to ensure that the design features that make current neighborhoods within the Town Core attractive for residents continues as the area develops, development standards adopted for the Town Core will ensure new neighborhoods have basic height limitations and setback requirements similar to those currently in existence. The development standards adopted for the Town Core will ensure new neighborhoods are of the same quality as existing neighborhoods by requiring new structures to have permanent foundations and meet basic roof pitch requirements. Additionally, lighting standards will be established to preserve the visibility of the night sky. 3.3.5 Provide park space that adds value to new neighborhoods. New parks should provide playground equipment and shall be located in a way that maximizes access to homes in new residential neighborhoods. Designate commercial areas within the core which meet the Guiding Principles of small town and rural atmosphere. 3.4.1 Allow for a variety of commercial uses. The community of Amsterdam - Churchill recognizes that appropriate new commercial development in the Town Core is desirable. The development standards adopted to implement this plan will designate a primary commercial area along Amsterdam Road between Churchill Equipment and the Amsterdam Store. Uses allowed in the area will be light commercial, retail, office uses, and businesses serving the agricultural operations of the area. In order to retain the small-town character of the Town Core, standards will also be adopted preventing restaurant drive-through's and establishing sign control for new commercial uses. 3.4.2 Require lighting standards for new commercial uses. Visibility of the night sky is an important element of rural Amsterdam - Churchill. The Amsterdam - Churchill community and Gallatin County will adopt development standards ensuring that additional commercial development will meet lighting standards designed to preserve visibility of the night sky. Those standards include requiring shielded and downward-facing lighting that does not expose neighboring properties or adjacent roadways to unshielded lighting. 3.4.3 Require landscaping for new commercial development and construction. Landscaping for commercial uses is an important element of retaining an attractive community. Development standards will be adopted requiring any new commercial construction (excepting agricultural construction) to plant new landscaping adjacent to roadways and neighboring properties. 3.4.4 Require commercial solid waste areas to be screened. Development standards will be adopted requiring commercial solid waste areas to be screened from public roads and adjacent properties either by fencing, landscaping, or the commercial building itself. 3.4.5 Require road mitigation of high-traffic uses. Many commercial uses generate as much as or more traffic than new subdivision. The development standards adopted to implement this plan will require high-traffic uses to mitigate impact on access roads. Mitigation measures could include improving road standards, paving, stop signs, or other traffic control measures. The development standards and land use map will require the use of frontage roads in the rear of properties connecting structures and properties, deep lots, landscaped buffers, and other site planning tactics along the primary access road to ensure that strip development is discouraged. Additionally, the development standards will encourage parking lots and other impervious surfaces to be placed along the rear or side of structures. Development standards will be adopted providing standards for the size of new signs within the Town Core. All existing signs shall be grandfathered. Specifically, standards will be adopted prohibiting blinking, flashing, or moving signs, as well as limiting the size and height of new commercial signs to that which is similar to the existing commercial signs in the Town Core. Standards shall allow off-premise signs primarily for directional purposes and prohibit billboard-style advertising. 3.4.8 Prohibit casinos, bars, and sexually-oriented businesses. Development standards will be adopted prohibiting casinos, bars, or sexually-oriented businesses within the Town Core. Multiple points of access will be required to most developments. Additionally, safe, functional connections between neighborhoods, and within residential and commercial areas and public places, will be required for new development. Providing multiple connections, including sidewalks and paths, can facilitate safe movement of school children to either of the two schools in the community. 3.5.1 Require Connectivity as a Condition of Development Approval. Commercial and residential developments must have safe, functional access for vehicles, pedestrians, and cyclists through the site. They must also be designed with enough right-of-way to have safe, functional connections with adjoining developments. 3.5.2 Commit to exploring ways to provide a new sidewalk along Churchill Road, Amsterdam Road, and Camp Creek Road, as well as trail and sidewalk options throughout the Town Core as needs are identified. There are two schools and three churches within the heart of the Town Core. This policy commits the community of Amsterdam - Churchill and Gallatin County to exploring ways to provide a new sidewalk along Churchill Road, Amsterdam Road, and Camp Creek to increase pedestrian safety between these public buildings and residential neighborhoods. Sidewalks and trails may be constructed using a combination of public grants (such as the Community Transportation Enhancement Program) and private donations, as well as required as a condition of approval for new development within the Town Core. Additionally, as the planning process proceeds, new connections and pedestrian needs may be identified. This policy commits the community and Gallatin County to explore opportunities to provide any future trail and/or other pedestrian connections that are identified. 3.5.3 Require a connection between Godfrey Canyon Estates and the rest of the Churchill Community to the north. The Godfrey Canyon Estates subdivision is physically separated from the rest of the Churchill community to the north. The Windmill Acres subdivision was granted preliminary plat approval in January 2009 and provides a trail connection between Godfrey Canyon Estates and the rest of the Churchill community to the north. If development plans change in the future, a road connection should also be provided in order to better connect areas within the Town Core. 3.5.4 Commit to exploring opportunities for a "rails to trails" project along the old railroad right-of-way west of Camp Creek Road. A "rails-to-trails" project along this old right-of-way could provide a designated pedestrian pathway along Camp Creek Road that serves both as a recreational trail and also as a way for students to get to the Amsterdam School. This policy commits the community of Amsterdam - Churchill to working with landowners along these roads to potentially designate them through the rails-to-trails program. 3.5.5 Require extension of a collector road from Kunje Road to the east and south generally along the border of Category D property. Extending a collector road east from Kunje Road and south to Flying Eagle Way generally along the border of Category D property provides a road routing traffic around the Churchill Town Core for both general traffic and emergency service vehicles that does not use the interior subdivision roads of the Churchill North subdivision. Also, any development in this area should comply with Policy 3.2.3 and Policy 3.5.8 and provide a collector-road connection to Phase II properties north and east of the Town Core. 3.5.6 Require a connection between Churchill Road and Camp Creek Road across the Ecton Property. As discussed in Policy 3.1, the Ecton property has an approved preliminary plat. If development plans change, however, this policy requires a connection, built to collector road standards, to be designed with any future development that would connect Churchill Road to Camp Creek Road and provide an alternative east/west route. 3.5.7 Create connections, when and where possible, between Land Use Categories A, C, and G through to Churchill Road. There is a general lack of connections between Godfrey Canyon Estates, the majority of the Churchill community to the north, and the Ecton Ranch. Because there are two approved preliminary plats for both the Ecton Ranch (Category C) and the Windmill Acres project (Category G), obtaining connections for all of these areas will only happen if development plans change. Should plans change for these two approved developments, new connections should be made between Category G and Category C, as well as south into Godfrey Canyon Estates to the south and Category A to the north. 3.5.8 Require new road connections to Phase II property to be built to "collector road" standards, rather than "interior subdivision road" standards. The "Future Land Use Map" for the Town Core shows several properties on the outskirts of the Town Core that will serve as Phase II property once the requirements of Policy 3.2 are met. In order to ensure appropriate access to those properties, new developments within the Town Core providing access to Phase II properties should construct any access roads to "collector road" standards rather than "interior subdivision road" standards. Churchill Road serves two purposes in the planning jurisdiction: first, it serves as the main street through the center of the Town Core, servicing three churches, a school, and several businesses, as well as the majority of residential development in the area; second, it serves as a State Highway providing access from Norris Road to the south through to Manhattan to the north. In an attempt to reconcile these two points, this policy recommends speed controls be applied to and maintained on the portion of Churchill Road within the Town Core. 3.6.1 Install a crosswalk sign at the intersection of Amsterdam Road, Churchill Road, and Kunje Road. As the Town Core grows, traffic, both auto and pedestrian, will increase. In order to ensure maximum safety and protect the small town character of the area, this Plan intends to encourage safe pedestrian opportunities throughout the Town Core. In order to facilitate those opportunities, a crosswalk should be installed at the intersection of Amsterdam Road, Churchill Road, and Kunje Road. 3.6.2 Install rumble strips at the north, east, and south entrances to the Town Core. While the Town Core currently has a speed limit of 25 miles per hour, that speed limit is not always followed. In order to help retain the small-town character of the Town Core, rumble strips should be placed at the north, south, and east entrances of the Town Core to ensure the appropriate speed limit is followed and help maximize safety for residents. 3.6.3 Install "speed reduction" signs at the north and south entrances to the Town Core, as well as on either side of the Amsterdam Road - Camp Creek Road intersection. As with Policy 3.6.2, speed reduction signs should be placed at the north and south entrances to the Town Core, as well as on either side of the Amsterdam Road - Camp Creek Road intersection to ensure the speed limit through town is followed. 3.6.4 Realignment of the Amsterdam Road - Churchill Road - Kunje Road intersection. When Kunje Road was constructed with the development of the Churchill North Subdivision, the intersection with Churchill Road did not directly align with the intersection of Amsterdam Road and Churchill Road. Primarily, this was due to the location of the Churchill Equipment property. While any relocation of the intersection will need to be approved by both Churchill Equipment and the Montana Department of Transportation, this policy encourages those discussions to take place between those entities and future developers within the Town Core as growth occurs and increased traffic uses the intersection. The Churchill Sewer District will continue to serve as the primary sewer provider in the Town Core. The Churchill Sewer District has been in existence since 1977. The system consists of three treatment ponds immediately northwest of the Amsterdam Road - Camp Creek intersection, and several collection lines throughout the existing development within the Town Core. The District is currently going through a Preliminary Engineering Report (PER) to evaluate the collection, treatment and waste disposal systems. According to a consent order with the Montana Department Of Environmental Quality (MDEQ) the results of this work will be completed by December 31, 2012. At that time the entire system will be upgraded and capable of handling existing and future connections through the year 2032. The system will be sized according to a growth rate agreeable to the District and the existing users; and, the total number of connections is yet to be determined. The following policies will ensure that new development in the Town Core will hook up to the District and that adequate capacity is available. The existing system is currently receiving wastewater flows in excess of the design and approved treatment and disposal capacity of the system. Wastewater treatment and effluent disposal capacity will be upgraded according to the PER. Ongoing evaluations will establish the capacity of the system and its ability to accommodate growth through the year 2032. In the interim, through 2012, the MDEQ has allowed the District a select few new connections which will be evaluated and granted according to District approval. 3.7.2 Require new subdivision within the Town Core to request connection to the Churchill Sewer District. New development in the Town Core shall request to be included within the Churchill Sewer District and pay the established hookup fee to the District. The Sewer District shall work toward development of policy to address future connections that will take into account the new connection's proportionate share of whatever debt is incurred in completion of the improvement project. These "hookup" fees should take into account the debt service, the cost of completing the physical connection to the system, and/or the determined "impact" to the overall wastewater system resulting from the connection(s) in order to insure that new development pays its fair share of the cost to upgrading the system. Because the Sewer District will be upgraded according to the PER over the next several years, it is possible that a new development requiring central sewer will precede any necessary improvements to the Sewer District's systems. To address this, the Sewer District should discuss adoption of rules requiring new development within the Town Core that is ready to proceed prior to upgrade of the system to coordinate with the Sewer District on issues of future compatibility and potential future inclusion. The only exception to the request to connect to the system within the Town Core shall be development in Land Use Category F due to the low-density nature of development that will occur. Homes in Land Use Category F may use individual, approved septics. 3.7.3 Study how to expand capacity as the Town Core grows. As the Town Core grows, it is likely that maximum capacity of the District's treatment system will be reached. In order to continue to provide quality service to the District's members, the District should study how the system will be expanded as development occurs in the Town Core and hooks into the District's treatment system. The Amsterdam - Churchill community will explore the option of creating a community water district in the Town Core. A reliable fire protection system based on hydrants tied to a single entity could result in more effective fire protection and a better ISO rating for the area. Better management of the groundwater resources in the Amsterdam and Churchill communities, by being able to manage the amount of water consumed and for what purposes. 3.8.1 Discuss the possibility of a community water system with local engineering firms in a public forum. Several local engineering firms specialize in helping local communities create sewer and/or water districts. In addition, there are several grant opportunities at the state and federal level that can help fund such projects. The Amsterdam - Churchill community should invite several engineering firms to present options for creation of a water district which could service the Town Core. 3.8.2 Discuss the benefits and challenges of forming a water district with the community. The first major challenge in creating a public, community water system would be to form a water district. This could be accomplished either by joining with the existing sewer district or by forming a separate water district. This policy commits the Amsterdam - Churchill community to exploring the options for formation of a district. 3.8.3 Require public water systems for new development. It is the policy of this community plan to require major subdivisions within the Town Core to provide a community water system, rather than individual wells. The only potential exception to this policy shall be development in Land Use Category F due to the low-density nature of development that will occur. Homes in Land Use Category F may use individual, approved septics. 3.8.4 Require new development utilizing Public Water Systems to possibly be designed to include a potential future community system. While there is currently no plan to create a water district, new development utilizing a Public Water Supply System in the Town Core shall design and plan its distribution system according to MDEQ standards. The system shall be designed, (i.e. providing easements and appropriately-sized pipes) in a manner which allows the distribution system to be hooked into a community system in the event one is created. The Amsterdam - Churchill community should investigate options for developing a water right bank. 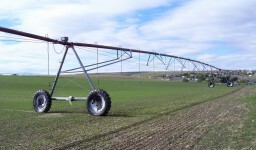 Water rights are required for any new wells or group of interconnected wells that pump more than 35 gpm and/or 10 acre-feet per year. Consequently, for future growth utilizing a community system and Public wells a methodology to acquire existing water rights or establish new water rights should be established. While the regulatory framework is not entirely in place, banked water rights could potentially be used for future water development. 3.9.1 Require new development to form a new lighting district or join the existing district. As new development occurs within the Town Core, new development should be safely lit. This may be done either by expanding the boundaries of the existing lighting district to include that development, or forming a new district serving the new development. This will require coordination between both the developer, Northwestern Energy, and Gallatin County. All new lighting fixtures installed shall be full shielded and designed to reduce light pollution, glare, and trespass as per Policy 3.9.2. 3.9.2 Adopt lighting standards to protect the night sky and rural atmosphere. In order to protect the night sky that provides much of the rural atmosphere for the community, the zoning standards adopted to implement this Community Plan will provide basic standards for new lighting. Specifically, standards will be adopted to minimize light trespass from new residential, recreational, and commercial buildings and sites, reduce sky-glow to increase night sky access, improve nighttime visibility through glare reduction, and reduce development impact on the night sky by adopting standards for new lighting. The importance of agricultural land and lifestyle has been a clearly identified value by the residents of Amsterdam - Churchill. While the majority of agricultural lands will be located outside of the downtown core and will be protected by directing the majority of growth into the core, several aspects of agricultural use will still be protected within the core as the area grows. 3.10.1 Protect water conveyance facilities by requiring new subdivision and construction to contact applicable water users and/or water conveyance facility's authorized representatives and mitigate any adverse impacts to the water conveyance facility. Require new subdivision to design development to minimize impacts to agriculture and water conveyance facilities. 3.10.2 Avoid conflicts between uses by requiring an open space buffer between existing agricultural operations and new residential subdivision. Preserving agricultural operations and lands is one of the Guiding Principles of this community plan. Increased residential development adjacent to existing agricultural operations can result in conflicts due to smells, noises, and hours of operation. To mitigate the immediate effects of potential land use incompatibility, zoning standards will be drafted requiring new residential development to provide an open space buffer next to existing agricultural operations. 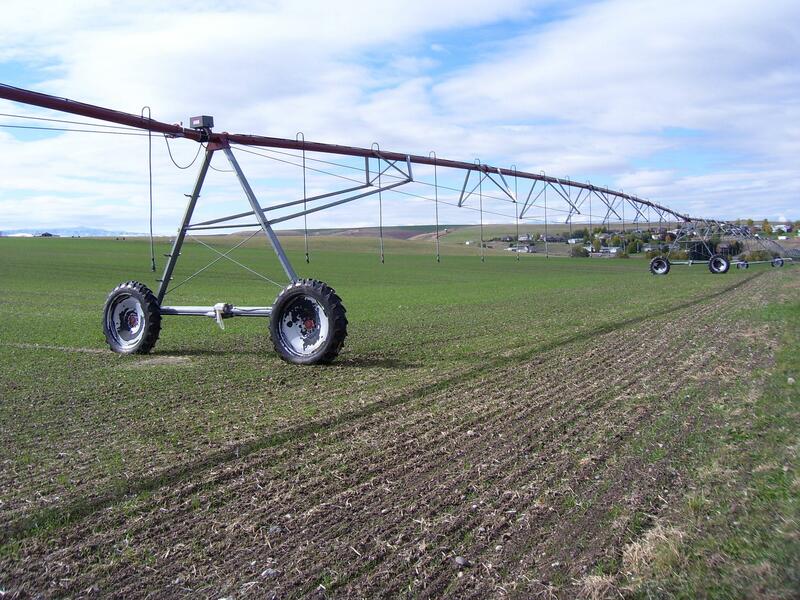 3.10.3 Exempt agricultural practices and structures from future development standards. 3.10.4 Exempt family transfer exemptions from any future development standards. 3.10.5 Recognize the right to farm and ranch in the Amsterdam - Churchill area. Agricultural operations are abundant throughout rural Amsterdam - Churchill. This policy states that non-agricultural landowners accept and are aware that standard agricultural and farming practices can result in smoke, dust, animal odors, flies and machinery noise, and that standard agricultural practices feature the use of heavy equipment, burning, chemical sprays and the use of machinery early in the morning and sometimes late into the evening. Adopt a land use map designating a rural area outside the Town Core that extends to the boundaries of the planning jurisdiction. New development in the rural portions of the Amsterdam/Churchill area will have a lower density than the downtown core. Opportunities will be provided for increasing base density through clustering techniques provided by the development standards adopted to implement this plan. Rural Amsterdam/Churchill is primarily an agricultural area. One of the key purposes of the Community Plan is to encourage and protect the agricultural land and support its favorable lifestyle . Development in Rural Amsterdam/Churchill shall not interfere with existing agriculture operations, including the normal operation of dairies, feedlots, potato cellars, and other agricultural activities that may, at times, be perceived as a nuisance by inhabitants of nearby residences. This policy states that landowners and residents accept and are aware that standard agricultural and farming practices can result in smoke, dust, animal odors, flies and machinery noise, and that standard agricultural practices feature the use of heavy equipment, burning, chemical sprays and the use of machinery sometimes 24 hours a day. Additionally, landowners will be required to file an "agricultural resource easement" with their property when new residential construction takes place, stating they recognize they are in an agricultural area and accept the right of agricultural operations to exist and continue. The importance of agricultural land and lifestyle has been a clearly identified value by the residents of Amsterdam/Churchill. Standards will be adopted protecting canals and ditches by requiring setbacks to existing water conveyance facilities and by adopting development standards promoting agriculture by setting clear standards on new development. 4.3.1 Protect water conveyance facilities by requiring new subdivision and construction to contact applicable water users and/or water conveyance facility's authorized representatives and mitigate any adverse impacts to the water conveyance facility. 4.3.2 Avoid conflicts between uses by requiring an open space buffer between existing agricultural operations and new subdivision. Preserving agricultural operations and lands is one of the Guiding Principles of this community plan. Increased development adjacent to existing agricultural operations can result in conflicts due to smells, noises, and hours of operation. To mitigate the immediate effects of potential land use incompatibility, zoning standards will be drafted requiring new residential development to provide an open space buffer next to existing agricultural operations. 4.3.3 Recognize the right to farm and ranch in the Amsterdam/Churchill area. Agricultural operations are abundant throughout rural Amsterdam/Churchill. This policy states that landowners and residents accept and are aware that standard agricultural and farming practices can result in smoke, dust, animal odors, flies and machinery noise, and that standard agricultural practices feature the use of heavy equipment, burning, chemical sprays and the use of machinery early in the morning and sometimes late into the evening. Agricultural lands and operations will mainly be protected by directing growth into the core of Amsterdam/Churchill and by adopting a residential density and development pattern in Rural Amsterdam/Churchill that matches the historical development pattern of the area. 4.4.1 Adopt a base density for new residential development in Rural Amsterdam/Churchill. Agriculture in rural Amsterdam/Churchill needs room to operate. Spraying fields, raising dairy cows, growing potatoes, driving farm equipment on county roads, and running cattle all require a landscape that is primarily devoted to those uses. In community meetings kicking off the planning process, community members identified agricultural land and lifestyle as one of the values the planning process should protect, and that value has become one of the guiding principals of the plan. Given the agricultural nature of the area, the overall density of new residential development in rural Amsterdam/Churchill shall be one lot per 160 acres. 4.4.2 Allow greater density in return for clustering development in a historic development pattern. Historically, rural Amsterdam/Churchill has seen limited residential development consisting of small lots clustered near existing roads and in existing farm clusters. This historic pattern will be protected by development standards allowing higher-density development in return for a clustered development pattern which protects existing agricultural lands. Those development standards will allow for new development of one lot per 80 acres if the additional residential lots are clustered. 4.4.3 Allow greater density in certain areas in Rural Amsterdam/Churchill. This plan recognizes that certain areas within Rural Amsterdam/Churchill have unique conditions and may warrant a higher residential density. In particular, the far southeast corner of the Planning Area is in close proximity to the Four Corners intersection, has direct access to Norris Road and major county and state transportation networks, and hosts a golf course. The regulations drafted to implement this community plan will contain mechanisms, such as a Planned Unit development provision, to allow developments generally meeting the circumstances described here to develop at a higher density in return for a design which protects and preserves the Guiding Principles of this Plan. Specifically, developments qualifying for a higher residential development density will be required to provide open space buffering adjacent to existing agricultural operations to offset the increased development potential. 4.4.4 Allow exceptions to the density requirements for commercial uses. Many agriculture uses in rural Amsterdam/Churchill have commercial or industrial components. Opportunity exists for potato wholesaling operations, fertilizer operations, or even agri-tourism ventures that support agriculture in the area but are not strictly agriculture themselves. Given this blurred line, density for new commercial uses that enhance agriculture in rural Amsterdam/Churchill shall be exempt from the density requirements of the development standards designed to implement this community plan. This exception shall also apply to lots created for utility or emergency service use. 4.4.5 Allow exceptions to the density requirements for subdivision exemptions and employee housing for agricultural operations. Many agricultural operations in rural Amsterdam/Churchill employ extended family or workers who live on the farm. In order to allow these types of operations to continue, uses such as family transfers and employee housing for agricultural operations shall be exempt from the development standards designed to implement this community plan. 4.4.6 Allow landowners to transfer development rights between properties in Rural Amsterdam - Churchill. In order to allow landowners to maximize property value while also retaining the agricultural land of Rural Amsterdam/Churchill, the development standards designed to implement this community plan will allow landowners to transfer development rights between properties. 4.4.7 Allow participation in Gallatin County's Transfer of Development Opportunities Program. In the event that a Transfer of Development Opportunities Program is established by Gallatin County at some point in the future, the development standards designed to implement this community plan will allow the sale of development credits or rights to growth areas in other parts of the County. Adopt Development Standards Allowing a Maximum of Flexibility for Uses While Exempting Agricultural Uses. 4.5.1 Exempt agricultural uses from all development standards. Protection of agricultural uses is the primary objective of this chapter. Development standards will apply to all uses except agricultural uses. 4.5.2 Allow maximum flexibility for new non-agricultural uses. The development standards adopted to implement this community plan will not list out permitted uses. Instead, all uses will be allowed with the exception of a minimum number of uses which will require a public hearing. 4.5.3 Require high-intensity uses to hold a public hearing. Certain high-intensity uses, such as gravel pit operations and commercial uses generating a high volume of traffic, will be required to hold a public hearing and possibly meet specific conditions to mitigate their impact on neighboring properties. 4.5.4 Prohibit sexually-oriented businesses, bars, and gambling establishments. Community members stressed the need to protect the small-town values of the Amsterdam/Churchill area. The development standards designed to implement this plan will prohibit sexually-oriented businesses, bars, and gambling establishments in Rural Amsterdam/Churchill. Detailing connections between various places within the planning district is one of the primary components of the Community Plan. Additionally, all new road improvements shall consider the needs of agricultural, such as the need to move stock or equipment. Amsterdam/Churchill is linked to the rest of Gallatin County by State and County roads. The primary arterial road in the area is Churchill Road, which begins near Interstate 90 in Manhattan, proceeds southeast approximately 6 miles, turns through Churchill, and ends at Highway 84 (Norris Road) approximately 10 miles south of Churchill (a total of approximately 16 miles long). Churchill Road serves as both the main street for the town of Churchill and as a state highway for through traffic. There are two east/west routes connecting Churchill Road with Jackrabbit Lane and the rest of the Gallatin Valley: Cameron Bridge Road and Amsterdam Road. A primary concern has been increasing traffic on these roads that has led to concerns both for safety and for the impact on local agriculture. The safety of Amsterdam Road has been a primary concern of community residents since the beginning of the planning process. Information obtained from the County Road Office show traffic counts on Amsterdam Road immediately east of the intersection with Churchill Road to be 1,700 Average Daily Trips (ADT's). Five miles east, as Amsterdam Road nears Belgrade and traffic from the River Rock subdivision join the road, traffic counts rise to over 13,000 ADT's. In order to handle increased traffic and improve safety along Amsterdam Road, basic improvements need to be made. Primarily, the road needs to be widened and a shoulder provided. Improving the road in this would not only improve the immediate safety of the road, but would also provide a clear route for traffic east to Belgrade that would provide relief from roads such as Cameron Bridge Road which provide direct service to agricultural operations. Additionally, improvements need to be made to the intersection of Amsterdam Road and Jackrabbit Lane. Improving the Level of Service at the intersection would potentially encourage drivers to use Amsterdam Road, thus alleviating traffic pressures on other, more agricultural, roads. 4.6.2 Consider agricultural when improving and connecting roads. Many of the roads in the planning district have very light traffic and are used primarily for agricultural uses, such as moving stock and equipment. While the Amsterdam/Churchill community has not seen the high growth experienced in other parts of the County, build out of the historic developments in and around the community have led to increased traffic on many key roads within the planning area. Specifically, Amsterdam Road has seen increased traffic in the past several years, and the paving of Cameron Bridge Road caused a substantial increase in the number of vehicles along that east/west route. Increased traffic on the roads causes an impact to agriculture in the area. While the primary tools to protect rural roads and the agriculture using those roads in the Amsterdam/Churchill community are the policies directing the majority of development into the Town Core, it is important that any new development that does occur in the rural area consider the need of agriculture on adjacent roads. Specifically, signage calling attention to the agriculture in the area and road construction that ensures farm equipment has enough room to operate and maneuver should be considered in the design of new roads. Additionally, any resources for road construction unrelated to new development should be directed towards improvement of Amsterdam Road. Upgrading that road to a safe status will encourage non-agricultural traffic heading east to Belgrade or the interstate to use Amsterdam Road rather than other routes, such as Cameron Bridge Road or River Road. 4.6.3 Consider trail improvements within the district after adoption of the Community Plan. There are several trail connections that should be made within the planning district that will require an investment in resources on the part of area residents. That investment will be more fully discussed after adoption of the Community Plan. specifically, those trail connections include a trail north out of Churchill towards Manhattan, and east out of Churchill towards the Gallatin River (preferably along Cameron Bridge Road). 4.6.4 Create a road connection north out of Amsterdam along the old railroad right-of-way to Coles Corner. Coles Corner, along Churchill Road north of Town, is one of the most dangerous sections of road in the Planning District. A road connection should be constructed north out of Amsterdam along the old railroad right-of-way directly north to Coles Corner to provide safer access out of town north towards Manhattan. 4.6.5 Create a trail corridor east from the Town Core along Cameron Bridge Road. Cameron Bridge Road is a narrow road with no shoulder, and providing a trail corridor would create a safe pedestrian- and bike-oriented way to move east from the Town Core. Several landowners have expressed interest in helping create a trail corridor, and this policy commits the Amsterdam/Churchill community to discussing the idea with landowners along both the north and south sides Cameron Bridge Road, as well as the County and the Gallatin Valley Land Trust. 4.7.1 Adopt standards requiring minimum setbacks to riparian areas, watercourses and wetlands. The Gallatin County Subdivision Regulations currently require setbacks of 150 feet to all watercourses as a condition of subdivision approval. Adopting development standards would extend these setbacks to all existing lots in Rural Amsterdam/Churchill and would provide significant protection to riparian and wildlife resources, as well as avoid potential floodplain issues. The Mission of the Gallatin County Open Lands Board is to work with the County Commissioners and the citizens of Gallatin County to preserve natural lands and encourage the economic viability of agriculturally productive lands. This is accomplished through voluntary programs, which ensure the protection open-space lands, either in perpetuity or for a term of years; and through the identification or establishment of funding sources, tax measures or other incentives. The Amsterdam/Churchill community is committed to exploring options provided by the Open Lands Board and tools, such as conservation easements, that can be used to preserve agricultural land. Ensure continued provision of fire and emergency services. 5.1.1 Explore fire impact fees. As the community continues to grow, additional population will result in increased calls for service. As demand grows, the all-volunteer system may require partially-paid staff and new equipment. To ensure that existing residents do not bear the burden of servicing new development, the County and the Amsterdam/Churchill community will consider adoption of Fire District impact fees for the Amsterdam Fire District. All new homes in the Amsterdam/Churchill planning jurisdiction shall have reflective three-inch lettered addresses with offsetting backgrounds plainly visible from the street entrance. The Gallatin County GIS Department shall participate in ensuring this policy is communicated to new homeowners in the Planning Area. 5.1.3 Fire protection sprinklers structures. In recognition of response delays due to restraints of an all volunteer system and travel times involved to reach developments in the rural Amsterdam/Churchill area, installation of fire sprinkler systems and defensible "green spaces" shall be encouraged. Additionally, State of Montana adopted fire code requirements for sprinkler systems in large commercial, community, and residential structures shall be met. 5.1.4 Require subdivision streets to connect in order to facilitate emergency service access. 5.1.5 The Fire District shall work with ISO and improve the insurance rating for the Fire district. 5.1.6 The Fire District and the Amsterdam/Churchill Planning Group commit to engaging the community in discussing the possibility of a public community water system. 5.1.7 New commercial and community development should contact the Fire Department for Knox boxes to allow undamaged entrance to structures. 5.1.10 Explore the option of a rural water supply system that would include multiple fill sites in a single district. In order to provide more efficient coverage to the rural portion of the planning area, the Fire District will explore options to create a rural water supply system consisting of approximately six to eight fill sights. The fill sites would be placed in areas to maximize coverage throughout the larger district and would be funded by low-density rural residential development. The fill site service areas would be planned, installed, and maintained by the rural community as a whole. This would provide an efficient, and less costly way of providing fire protection to the larger area, rather than requiring each individual subdivision to provide individual and separate fire protection. The community and Gallatin County should actively explore options to help the Amsterdam School expand as new growth occurs in the Town Core. The Amsterdam School is the only public school in the Amsterdam/Churchill Planning District. Constructed in 1962 on a 2.9 acre site, the 19,000 square foot school building provides education for grades K-6. The School District recently passed a $1.2 million school bond. The bond was used to construct 4 new classrooms and a multipurpose room serving as a cafeteria and assembly space. All of the classrooms are now in use. Water for the school is provided by a well, located just east of the school building. A second well will be drilled. The approved Amsterdam Village preliminary plat has agreed to donate $1,000 per lot at development proceeds. That voluntary impact fee will only be paid, however, upon approval of final plat. City of Manhattan Schools currently educate grades 7-8 from the Amsterdam School District. However, Manhattan will now charge a tuition for these students to be funded by permissible levy. The Planning District designates land within the Town Core as appropriate for new development that will create neighborhoods similar to those already in place. These new neighborhoods will, as they build out, send an increasing number of students to the School District. 5.2.1 Amsterdam School should prepare a School Facilities Master Plan. Amsterdam School District has prepared a School Facilities Inventory, as part of the planning for the Amsterdam Village development, to prepare for new students. The School District should continue this work and develop a school facilities Master Plan, including infrastructure, utilities, and service requirements projections. Amsterdam School District should work with the Gallatin County School Superintendent to ensure an annual discussion with the Board of County Commissioners regarding the status of the school and growth in the area. 5.2.3 Request a voluntary impact fee from new development. Amsterdam School District should request a voluntary school impact fee from new residential development. Additionally, major subdivisions shall provide a school mitigation plan to discuss impacts on the Amsterdam School and potential solutions. 5.2.4 Ensure new development appropriately mitigates their impact on the school district. New development in the Amsterdam/Churchill area should confer with the Amsterdam School District to discuss mitigation measures. In order to preserve the scenic qualities and natural environment of the area, the small town and rural atmosphere, and the property values of area residents, the development standards designed to implement the Amsterdam - Churchill Community Plan will contain standards addressing community decay. 5.3.1 Draft development standards addressing "community decay". "Community decay" is a public nuisance created by allowing rubble, debris, junk or refuse to accumulate resulting in conditions that are injurious to health, indecent, offensive to the senses or which obstruct the free use of property so as to interfere with the comfortable enjoyment of life or property. A "Nuisance" means anything which is injurious to health, indecent or offensive to the senses, or an obstruction to the free use of property, so as to interfere with the comfortable enjoyment of life or property. A "Public Nuisance" means a nuisance, which affects, at the same time, an entire community or neighborhood or any considerable number of persons, although the extent of the annoyance or damage inflicted upon individuals may be unequal. A nuisance does not include anything which is done or maintained under authority of a statute, nor does it include the normal operations of an agricultural or farming operation that have been in operation longer than the complaining residents and/or establishments. Material that may constitute community decay includes, but is not limited to, bricks, concrete, wood, cardboard, paper, pallets, tires, dead animals/animal parts, dirt, demolition waste, junk vehicles, wrecked trailers, iron, metal, machine parts, appliances, and barrels. Community decay does not include normal farming, ranching or other agricultural operations, or apply to a farm, ranch, or other agricultural facility, or any appurtenances, thereof, during the course of its normal operation. Refuse, including general household trash whether bagged or loose, discarded furniture, appliances, broken toys, etc.) shall not be allowed to accumulate outside. Residents shall provide for routine garbage pickup, or otherwise ensure garbage is hauled away in a timely manner(generally within 30 days). Residents shall not engage in any activity that causes noxious odors to spread beyond the property line (examples stockpiling dead animals at a processing facility, or auto body painting). All farming and ranching activities are exempt. In order to help investigate options for treating several of the arsenic issues that have arisen in the last couple of years, as well as helping individual landowners with their water quality issues, the Amsterdam/Churchill community will explore annexing into the Gallatin County Local Water Quality District. Adopt standards addressing sand and gravel resources. Based on changes the 2009 Legislature made to §76-1-601 MCA, all Growth Policies must include a description of sand and gravel resources within the jurisdictional area. Review of the USDA Soil Survey for Gallatin County shows few sand and gravel resources within the planning area. However, mapping in the Gallatin Valley is especially challenging due to poor exposures and the difficulty in distinguishing lithologic units. Nonetheless, geologists have given the valley considerable attention. Detailed and comprehensive analysis and geologic maps are described by the following sources which are referenced herein, but not included as part of the Amsterdam/Churchill Community Plan. These maps are available on a CD from the Planning Department. 5.5.1 Draft standards prohibiting sand and gravel mining operations with the Town Core. Given the general residential nature of the Town Core, sand and gravel mining operations will be prohibited. 5.5.2 Draft standards allowing sand and gravel mining operations as a conditional use within the rural portion of the Planning Area. As per policy 4.5.3, high intensity uses such as sand and gravel mining operations will be allowed as a conditional use in the rural area and require a public hearing. The Amsterdam/Churchill community and Gallatin County will adopt a zoning regulation to implement the goals and policies of the community plan. Many of the goals and policies of the Amsterdam/Churchill community plan call for specific development standards to be adopted. The community and Gallatin County will draft a zoning regulation specifically designed to implement the community plan. The Amsterdam/Churchill community will form a non-profit organization expressly dedicated to serving as a forum for exploring community growth and change issues. The non-profit will ensure that the investment strategies named throughout the plan are implemented, will address any substantial changes or updates to the community plan and/or development standards, and will advise the Gallatin County Commission on issues that would affect the AC community. This plan ends with a reminder that, while this is the first community plan for the Amsterdam/Churchill area, it was written on a foundation of Guiding Principals obtained through an inclusive process involving several hundred individuals. As the community continues to grow and change, decisions that affect the area should be weighed with those Guiding Principals and the planning policies in mind. Likewise, this document is not set in stone but should be revisited and revised as the need arises. Generally, the Amsterdam/Churchill community should consider reviewing this plan every five years. As the discussion about Amsterdam/Churchill continues and the plan evolves over time, that vision should continue to serve as the foundation for future community conversation.